In Spring 2018, the UMass Venture Development Center (VDC) collaborated with my MBA ‘Strategic Management’ capstone class to jointly assess and further develop selected innovative new ventures supported by the VDC. Overall, seven MBA teams with three to five students each were set up to work with seven Global Entrepreneurs in Residence (GEIRs) developing products and services across various domains, including hospitality, human resource management, real estate and trading. The core of the MBA research project was about assessing the market potential of new venture ideas, the development of lead client and supplier relations, and the role of networks and ecosystems in supporting the process. Each MBA team was expected to do Internet-based market research, review available information on the new venture and conduct interviews with the entrepreneur and their team members. Based on the data collected, each team gave two presentations – one focusing on the market potential of the product or service, and one on implementation challenges and strategic recommendations. The second team presentation was hosted by the VDC, with the majority of entrepreneurs participating as well. Finally, each team compiled a final report putting all the findings and conclusions together. The report will be made available to the entrepreneurs for their reference. This collaborative project was the first of its kind with the VDC and will be the starting point of a potential series of projects with future MBA classes. 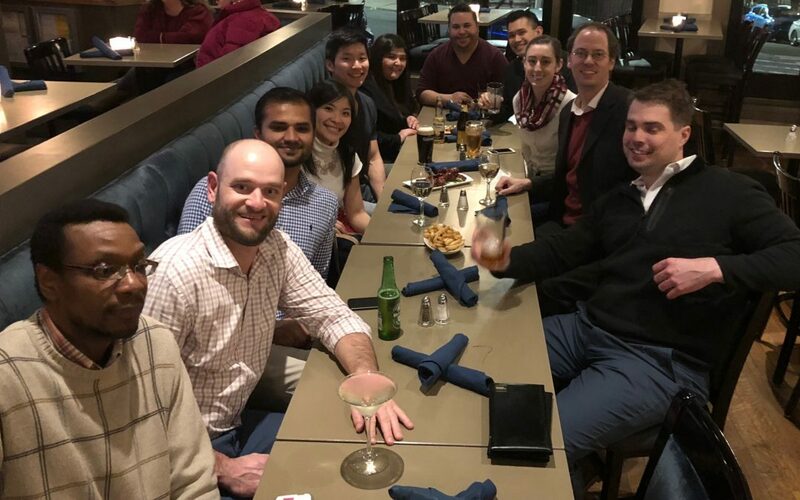 Connecting with the GEIRS and learning about their new ventures was an extremely valuable experience for my MBA students. The feedback I have received on this collaboration was entirely positive. Not only were students able to directly apply conceptual knowledge of market conditions, competitive challenges and key success factors to concrete cases but learning about new ventures gave them highly specific contemporary industry knowledge and insights into how to innovate within specific industries. Also, this project gave students the opportunity to learn about alternative entrepreneurial career paths. All GEIRs were extremely helpful in sharing their ideas, challenges and experiences as entrepreneurs with my students. In turn, GEIRs benefited from the business perspective of my students. Most GEIRs have a science or engineering background, whereas their knowledge of market forces and strategic positioning is more limited. GEIRs confirmed to me that bringing in fresh viewpoints through a business lens was highly valuable to them. This project was thus a win-win for both parties. I am convinced that this or a similar collaborative format will be extremely valuable for other professors and students groups as well. In addition to the main collaboration, GEIRs also assisted in other ways throughout the semester. First, one GEIR was invited to come to class to talk about their venture and engage the class in small groups to discuss go-to markets, adjacent markets and opportunities of internationalization. The discussion was very fruitful, and the GEIR got some new ideas as to how to demarcate test client markets to make the product launch less risky. Second, another GEIR was invited to my undergraduate class ‘Managing in the Global Economy’ to both talk about their venture and the thinking process behind it, and share with my students their career path coming from Europe and working in the U.S. Third, one GEIR was invited as a panelist to my regular career development workshop, again in my undergraduate class. Along with two former UMass students, the GEIR was asked to share with my current students the pros and cons of starting an entrepreneurial career and working for start-ups, compared to larger, more established firms. Compared to other business schools, the number of students at UMass Boston who would consider an entrepreneurial career from the get-go is rather low – not because of lack of skills or ideas, but mainly because of family expectations, and because of lack of role models and inspiration. Inviting GEIRs to come to class and share their experiences with our students is therefore a very valuable and effective tool to provide more entrepreneurial role models. In addition, GEIRs are excellent guest speakers as experts in their industries, in future trends and innovation. Based on my own experience, I would definitely want to work with the VDC again. Plus, there are multiple ways of extending and expanding collaborative models to make them even more effective and valuable. First, joint projects could be run as separate courses, e.g. venture development prize contests, involving selected student groups from multiple departments. One reason why so many high-potential entrepreneurs come out of MIT is because of their cross-disciplinary start-up contests where students from multiple fields, e.g. biology, environmental science and business, come together, develop ideas, get assessed by industry experts, and get support launching their projects. Giving the entrepreneurial experience of GEIRs, such cross-disciplinary projects could be launched at UMass Boston as well, hosted by the VDC. GEIRs could serve as mentors and judges in the process. Second, collaborative projects could be systematically combined with internship and further career opportunities for students. UMass graduates are known for being hard-working and eager to learn, whereas they often lack the confidence characterizing Harvard and MIT students. Internships with the VDC could change that and help students develop the soft skills needed to excel in the business world. Also, internships are an ideal way to transition into exciting career paths in the tech and social entrepreneurship community, as well as in larger organizations in need of people with start-up experience. Third, and relatedly, VDC GEIRs should more proactively reach out to UMass graduates to fill positions. UMass graduates tend to underutilize their potential due to lack of exposure to career opportunities on campus. Likewise, the VDC has underutilized the talent pool on campus. Both can be remedied through regular recruiting and network events connecting students with entrepreneurs. Overall, I see a bright future in further embedding the VDC with the UMass Boston Campus. Joint collaboration at multiple levels can not only enhance the educational experience and career opportunities for students but also boost the market, growth and competitive potential of VDC entrepreneurs in Greater Boston. I want to say thank you to UMass Boston, particularly to the VDC and professor Stephan Manning, for providing me an opportunity to share my knowledge in startups with the students. Throughout the Spring 2018 semester, I spoke at a supply chain management panel, participated in the MGT 689, Strategic Management Class, and held an undergraduate career workshop. I heard great in-class discussions and listened to some impressive strategic analysis of startups by the MBA students in Stephan Manning’s class. The presentations were compact and thorough with detailed analysis of the companies that participated in the study, including Soofa, the startup I was representing. Startups should not miss out on UMass Boston’s students because they have great understanding of business development and can present some interesting ideas to help grow your startup and increase revenue. I hope to stay involved in similar projects at the VDC and continue building relationships at UMass Boston. Feel free to reach out to me on LinkedIn (https://www.linkedin.com/in/robert23kim).